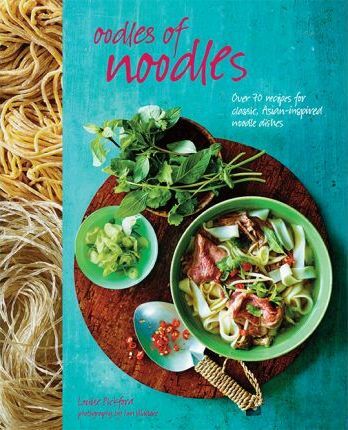 Begin with Noodle Basics where youÃ¢â‚¬â„¢ll find detailed information on the different types of noodles, flavors, and fresh or store-cupboard ingredients that are found in the very best of noodle recipes, alongside basic recipes for oils, stocks, dressings, toppings, dipping sauces, and more from all over Asia. The recipes take inspiration from many countries, including Japanese Chilled Soba Noodles and Salmon and Scallion Gyoza, Vietnamese Beef Pho and Green Papaya and Crispy Pork Salad, traditional Crispy Shrimp Balls from China, Singapore Hokkein Noodles, and Korean Noodle Dumplings, as well as recipes from Burma, Malaysia, Cambodia, and Laos. Fresh, tasty, and bursting with nutritious ingredients and lively flavors, noodle dishes have never been more popular. Learn how to cook, serve, and eat them following LouiseÃ¢â‚¬â„¢s straightforward recipes that give thoughtful insight into the provenance of each dish. This collection of aromatic and sizzling hot recipes is a must for any lover of more exotic and adventurous food.